First post here, but long-time lurker. I have posted this on Reddit as well as several other Wrangler forums. I drive a 2017 White Jeep Wrangler Rubicon Hard Rock which has 24,500 miles and is still under Jeep's standard warranty. On Sunday, April 29th 2018 my girlfriend and I were driving home from our cabin in the Sierra Nevada mountains in California. We were driving south on highway 14 near California City. It was quite a windy day and I was driving 60mph when suddenly the two hood latches and the middle latch failed causing the hood to slam into the windshield. My vision completely blocked by the hood and my life flashing before my eyes, I navigated the vehicle to the side of the road. My girlfriend and our cat suffered no visible injuries, but the windhsield was shattered and there was significant damage to the hood, windshield frame, windshield, and parts of the roof. I have AAA, but as we were far out they would only tow us 7 miles for free. The closest dealership was Hunter Dodge Chrysler Jeep Ram in Lancaster, California 45 miles away so we were towed there for a $231 expense. It was around 9pm when we arrived so we put the keys in the deposit box, left the car, and left a note indicating what happened and asked for repairs and reimbursement of tow expense per the warranty policy. The warranty policy states: "The Basic Warranty covers the cost of all parts and labor needed to repair any defective item on your vehicle that was supplied by Chrysler Motors — that is, defective in material, workmanship, or factory preparation. There is no list of covered parts since the only exception is tires. You pay nothing for these repairs. These warranty repairs or adjustments — including all parts and labor connected with them — will be made by your dealer at no charge, using new or remanufactured parts." In regard to towing, the warranty policy states: "The Basic Warranty covers the cost of towing your vehicle to the nearest Chrysler Motors dealer if your vehicle can’t be driven because a covered part has failed". In regard to how long the warranty is for, the policy states: "The Basic Warranty lasts for 36 months from the date it begins or for 36,000 miles on the odometer, which ever occurs first." In regard to how to claim the warranty, the policy states: "In the U.S., U.S. Possessions and Territories, Mexico, and Canada Chrysler Motors generally recommends that you take your vehicle to the dealer where you bought it. But any authorized Chrysler Motors dealer can work on your vehicle. Except in emergencies (see 4.2), only an authorized Chrysler Motors dealer may perform warranty service on your vehicle. By Monday afternoon, Hunter Dodge Chrysler Jeep Ram had not called me. Instead, I called them and asked for an update. They informed me that they cannot fix this and that for an issue like this I need to contact my insurance and get it worked out and additionally I need to get my car out of there by Tuesday. I told this person that the part failed, caused damaged, and I was claiming my warranty. He said that is not possible and that I need to get it towed to a body shop to get repaired. I refused since that would destroy the evidence of this issue that could lead to a fatality in the future. Furious at this point, I called the National Highway Safety Board to file a complaint. They processed my complaint and suggested that I contact the Jeep manufacturer as a next step. They provided a number for the manufacturer which I then called. The Jeep manufacturer representative was understanding and pleasant to work with. I explained to her my situation, the impact it could have to other drivers and she seemed to understand. She said she would need to place me on hold and contact the dealership where the car is at to verify. She put me on hold and contacted the dealership. When she returned to the line she informed me that the dealership stated that there was a "collision" and that since there was a collision there is nothing they can do. I told her unless a cannonball colided with my hood, this is not possible. She understand and suggested that I possibly tow the car to another dealership for a different diagnosis. Even more furious at this point, I called the Hunter Dodge Chrysler Jeep Ram dealership back to find out why they have provide the jeep manufacturer with this diagnosis. I asked for the manager of the service managers and was directed to Leilani Chacon, who is the service director. She said that she is not sure who told the manufacturer that it was a "collision" - it was not her. However, she said that she spoke to the area director and he informed her that he had never heard of this happening and that I needed to go through insurance and take it to a body shop. I told her just because they have never heard of it happening does not mean it didn't happen -- and that this could lead to a fatality if not diagnosed and resolved. I asked her if I could call back the manufacturer and if she could speak to them directly and she agreed. Leilani was pleasant to work with and was understanding, but didn't seem to have the power to fix my situation. I called back the Jeep manufacturer and the person on the phone successfully spoke with Leilani. However, he informed me that due to the nature of the issue he would have to escalate the issue to a "Claim Manager" on his end. He informed me that a claim manager would be reaching out to me within 24 hours. Frustrated at this point, I reached out to everyone Chrysler FCA executive on LinkedIn I could find. I sent 15 In-mail messages directly to these executives explaining my issue and providing a link to photos of the incident. I did not really expect to hear back from anyone, but thought it was worth of shot. All of the above took place on Monday, the day after the accident. Today, on Tuesday May 1st, I awoke to a LinkedIn message from a Referral Service Manager with Chrysler FCA in Detroit. He inquired if it was I who contacted the C-level executive regarding my Jeep issue and asked if I could provide a phone number, my VIN #, and my mileage. I provided all of these details and he said that someone from his team would be reaching out tomorrow, Wednesday 5/2 to discuss further. Finally, it felt as if I was getting heard. I am looking forward to that conversation and continued to pursue every other channel I could think of. As the Jeep manufacturer that I had spoken on the phone to the previous day informed me that a "Claims Manager" would be reaching out within 24 hours, I eagerly awaited their call. After 24 hours had passed and no call, I called them back directly. The person informed me that my case could not be handled by them, but instead would be handled by "Jeep Wave". The Jeep manufacturer transfered me over to the "Jeep Wave" department and I explained my entire situation again to the agent on the phone. He said that due to the nature of this issue, he would escalate it to a "Special Investigative Unit" and this unit would be getting back to me within 2 to 4 days. He was pleasant to work with, but ultimately he was limited in what he was able to accomplish. It has been two days since the accident and I have not made much progress. My car remains at Hunter Dodge Chrysler Jeep Ram as I refuse to move it since they are failing to honor my warranty. I do not want to get the car fixed yet and destroy evidence that could lead to a fatality. I have filed complained with the NHSB, the FTC, and the California Attorney General due to failure to comply with the stated warranty. Many of us have experienced hood flutter over the years - now an accident has occured from it and it is time that it finally get addressed. I searched the National Highway Safety Board complaints and found 5 other similiar complaints. My windshield could have easily shattered and severely injured my girlfriend and I from the intense inmpact of the hood. We were lucky. My car is very stock -- stock tires, stock rims, stock hood latches, stock suspension/stock lift. To my knowledge the last time the hood was opened was for an oil channel months earlier at Russel Westbrook Chrysler Jeep Dodge Ram. If anyone has any specific questions, please ask and I will do my best to answer. I will continue to update this thread with my progress. Stay safe. atxatxatx, flimmy and Wrangler Finger Waggle like this. Squerly, Mudman1 and GunNut37086 like this. Our Wrangler Forum is the largest Forum, by registered member count. Yes, many have reported hood flutter, but what you have experienced..is a whole new level. Fortunetly nobody got hurt. IA Grl, Casca63 and Alpenglow like this. 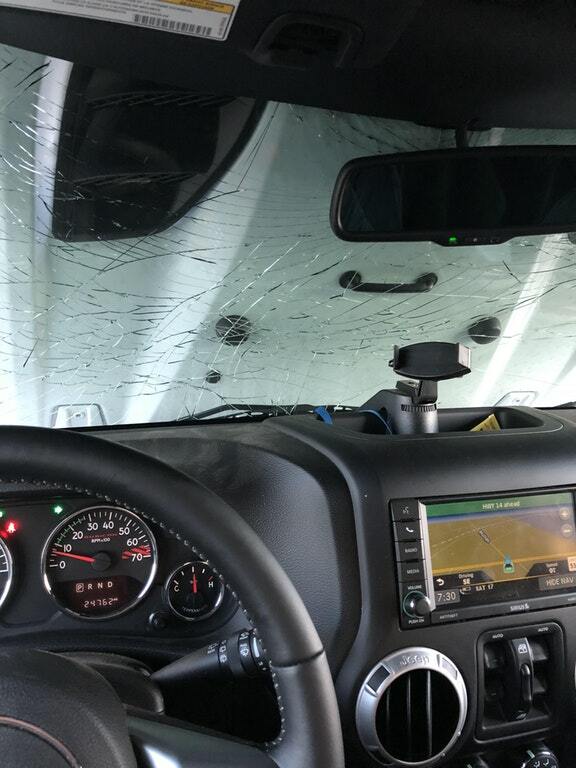 I have experienced hood flutter before in my TJ and 2015 Sahara, but not very violent. I have not experienced it in my Chief which has that same hood, and thought that maybe since it had the vents that it was less susceptible to it, guess not. Now I do know that the "fake vents" on my hood do have a round hold in the bottom flat part which you can only see when you open the hood. I have had the Jeep up over 80 on a Texas Interstate with no issue, but I have to rethink that now. I may invest in the metal latches. Looking at the photos, apparently the left side rubber piece broke which is the weak point on the latches after years of service, but your Jeep is too new for that to be the cause. The right side apparently with the added stress the plastic latch failed because the rubber piece still appears intact. Then we have the issue of the hood catch that is supposed to prevent the exact situation which occurred, the folding of the hood backwards over the windshield. It obviously failed in it's duty. Somewhere on here is a video from a dash cam of a left latch failure and the hood folding up on a line from roughly the hinge to the center catch, but the catch held as did the right side latch. The extent of damage in that case was the hood and they driver was able to proceed to a rest area where he pulled over. I am a little surprised that the Chrysler team has not descended on the dealership where your Jeep is to diagnose the failure. Of course they may already know the issue, after all they redesigned the JL hood latches. Thank you for reading my story and for the reply. I hope that Chrysler will send someone to the dealership to take a look at the car. At the very least, they should investigate. I saw that video you mentioned as well while researching on this forum-- quite scary. You might send a link to that video to whoever you are communicating with at Chrysler. While they might know it exists, it will let them know that you are aware of it as well. Looking at the photos again, I see the right side latch rubber section failed as well. Instead of breaking in the center where they usually break, the bottom pulled off of the pin. You can barely see the ripped area on the bottom section. I'm incredibly sorry for your situation and how things are going, or NOT going maybe I should say. We've owned 9 Jeeps to date. (3) CJs, (2) YJs, (3) TJs and now, (1) JK. Each and EVERY ONE OF THEM HAD/HAS HOOD FLUTTER during head winds, oncoming vehicle effects (mostly large trucks like 18-wheelers) and the like. It has always been unnerving to see those hoods start wavering at a high rate of frequency, even for a few nano-seconds. It was/is for that/those reasons, on every single one of the Jeeps we've owned, including the one we have now, that was have changed hood restraints to a much more positive version which, has always been one of many designs put out by the aftermarket companies. Once those alternate hood restraints were installed, NEVER did those hoods regain any flutter, period. And as I understand it, Jeep always knew about those "flutters" and, for the '18 JLs, it has been corrected. Hmmmmm, do you suppose they knew/know something? This is an odd predicament as I don’t think I have ever heard of body damage being covered by a warranty. But, it will be covered by vehicle comprehensive insurance. - It’s for accidents not a result of a collision. It’s going to be hard to prove there was a part failure and they can refute and claim someone improperly secured the hood. If it were me I would cut my losses and go through insurance. Think of a vehicle fire that starts spontaneously and destroys the vehicle. That’s typically covered by insurance. 2014 JKU Willys 6-spd, RK X-Factor 3.5", Fox Resis, KM3 37s, PR60s, Eaton e-lockers, 5.13, Atlas II 3.8, and another $10K in miscellaneous parts. Thanks for responding and sharing your thoughts. What is the point of a warranty then? Car insurance may help pay for damage to your car as the result of collision or some other cause, like a fire or theft. Your policy likely won't cover problems due to mechanical or equipment breakdowns. I have Geico, and they may help cover this, but the point is that it is an equipment breakdown which caused this. 87_WhyJay and Squerly like this. Insurance doesn’t cover a mechanical failure, but will cover the aftermath of one. If your hood flew off and hit another vehicle or your own vehicle that’s the aftermath. Another example. If you parked on a hill and the parking brake failed and the vehicle ran through somebody’s house. Now that scenario could get real messy with civil lawsuits and possible criminal charges if someone was killed in the house. I have a friend who is a forensic investigator and looks into these kinds of things all the time and testifies in court for civil lawsuits. Having Chrysler investigate the failure mechanism is like letting the fox guard the hen house. Now if your hood flew off and went through someone’s windshield and killed somebody, I would definitely have a forensic investigator of my own on the scene and get the thing out of Chrysler’s hands as fast as possible. It sounds like someone at the dealership may have looked at the damage and jumped to conclusions that a collision of sorts took place, rather than looking at what actually caused the damage. It wouldn't surprise me that the dealership would rather offload the work and cause onto the owner's insurance policy than fight with mother FCA that a part contributed to or caused the damage and should be a warrantable repair. They are either under-thinking/over-simplifying the issue, or are consciously trying to wash their hands of the issue. Hood flutter is a known issue with the Wrangler, and has been for years. The hood latches are one of the contributing causes of hood flutter- latches that weaken over time allow the hood to flutter, with flutter getting progressively worse as the latches continue to weaken and stretch, but those latches don't normally fail in a manner that allows the hood to break free of the latches or the main catch at the center of the hood. An inspection of the latches for defects in materials or workmanship would be the logical place to start for the dealer. I think it would be worth pursuing up the ladder at FCA for warranty repair, but I would do so with only guarded optimism...I can see getting the brush-off from multiple levels of management for liability reasons and FCA not wanting to set a precedent. A candid conversation with the insurance company might be worth having, in case things go nowhere at the dealer and with FCA. Sadly, I could also see the insurer wanting to offload the matter onto the dealer with the vehicle owner caught in the middle. Good luck to you OP, whichever route you go. Hope things get resolved satisfactorily. Thanks everyone for chiming in with thoughts and feedback. There is definitely little incentive for Chrysler to acknowledge this issue -- acknowledging it could cost millions of dollars in potential recalls. I did some research and it appears I might have a lemon law argument if I take it to another dealership and they do not repair it. Though the law in California states 18,000 miles maximum, it appears that the mileage limit is loose and 24,500 may still be honored. This is why I will be adding a Tuffy hood lock like I had on my Willy's. It will obviously slow dow a thief, but more importantly it will eliminate hood flutter completely. Spartan65USMC, old8tora, NaptownLarry and 1 others like this. I installed a BOLT hood lock fairly shortly after getting the current Jeep. I never experienced serious hood flutter on either JK without a hood lock installed, but after getting caught in some serious cross winds on the highway during a storm strong enough to bring down trees, combined with turbulence from tractor/trailers one lane over, I heard some slight flutter as the hood banged against the latch on the strongest gusts...nothing visible however. Spartan65USMC, old8tora, Alpenglow and 2 others like this. OP, your picture ended up on a Wisconsin FB group I belong to. Not sure if it was you who posted it there, but it sure seemed like the poster was the driver. Anyway, as a result I ordered and installed the Rugged Ridge hood latches. Ordered yesterday, installed today. I was driving through SD last week and there were a few times I thought I was going to eat Rhino. Sorry this is happening, and I'd be as angry as you if not more. Sad to say, unless the Gubernmunt gets involved, your insurance will likely have to pay for it. Maybe Jeep would cover the deductible, but I don't see it going much further than that. All the best. Remember, as much as we love our Jeeps, lives are more important. Spartan65USMC, old8tora and Alpenglow like this. Thanks everyone for continuing to check in and good to hear the word is being spread about this potentially deadly defect. I did not post the image on any Facebook groups, but the person may have copied my text from either here or on Reddit. Glad to hear most of you have already found ways to counter the flutter by installing accessories. Insurance may have to cover, but my wallet will sure hurt with my decision to set a $1,000 deductible. Man your story and photos made my stomach turn. So glad you, your girlfriend and fur baby didn't get hurt. Nor anyone else for that matter. As a jumpy person, I am not sure if I would have not ended up all over the road. Not to mention having to clean my pants in the aftermath. I had a deer hit the side rear of my car years ago..ended up paying property damage...yep I was all through someones yard. Sad you are having to go through all this...happy that know one got hurt. Alpenglow and Mudman1 like this. I'm with the other's here that installed a hood lock as soon as I got my Jeep, (I got the Mopar version that automatically keys to the ignition key during installation). I installed mine primarily for security to keep people from easily being able to snag expensive items like sPod, air compressor, battery, etc from under the hood. And secondarily to resolve any future hood flutter issues as the stock hinges lose tension. What amazing to me is that Jeep (Fiat) STILL isn't putting a hood lock on new Jeeps as a standard part of the build, especially since hood flutter has been a problem since the dawn of time with Jeeps. No other vehicle in America that I'm aware of comes without a locking hood, most of which disengage from inside the vehicle. It would be like selling a vehicle with no door locks and calling them Optional... WHY ??? JK4Three, Spartan65USMC, old8tora and 2 others like this. 2018 JKU WILLYS - Automatic, Prem Soft Top, Alpine Speakrs, Alpine i209-WRA Restyle, Smittybilt Gen2 XRC Bumpers, Smittybilt X20 10k Synthetic winch, Barricade Rock Sliders, Rock Krawler 3.5" Flex System Lift + High Steer Drag Link + Rear Track bar, Nitto Trail Grappler 35's on Rockstar3 9x17s, TeraFlex HD Tire Carrier, ARB Diff Covers, Tom Woods 1350 Drive Shafts, Spicer D44 Front Axle w eLocker, Rear eLocker, Regeared to 4.88, NP241OR T-Case. Id call your insurance agent and ask. If it isnt something insurance should cover they shoukd help you fight FCA. But im guessing they will take care of it. I Dont like it but I do think it is an insurance issue. If your brakes failed and you hit a tree the faiked brake part would be waranty but the collision would be insurance. If a tire blew and dented your body the body damage would be insurance. So your hood latches broke which should be covered my your warranty. But then your hood had a collision with your windshield which is insurances problem. I'm glad to hear you and yours are okay. I bought rugged ridge latches for looks and the bolt hood lock for security. It fixed the flutter. I offered to do the same for my wife's Jeep but she said she didn't want it. After hearing this story she doesn't get a choice. Going to order her some today. old8tora, Alpenglow, rockflagandeagle and 1 others like this. As I posted over in the hood flutter thread, as a sixteen-year old I had a similar incident when I was driving my Dad's wife's Datsun station wagon on the local bypass. Without any warning, the hood broke loose from the front and slammed into the windshield, completely blocking by my view. I had the sensation of having just run into a brick wall. Took me a few seconds to figure out what had just happened, that I was still alive and, that just as importantly, I was still moving at 60 mph with zero visibility. Hung my head out the window as far as I could to see what was in front of me and slowly pulled over to the right, all the while fighting the urge to panic. Thank God there was a shoulder and no one was parked on it. Forty five years later, I still remember how frickin' scary that was. Which is a big reason why I got a hood lock and aftermarket hood latches. I never want to go through that again. Good luck dealing with this. old8tora, Alpenglow and Mudman1 like this. 2017 JK WW. OEM - Auto Trans, LEDs, PST and EVTS. Aftermarket - AEV 2" Lift. Hyline Front/Rear Bumpers, Light Bar and Air Dam. WARN VR8-S Winch. ARB 7-inch Intensity and Rigid Cube Lights. sPOD. Teraflex HD Hinge Tire Carrier. ARB Diff Covers. Kenwood DNX 893S HU, Focal Speakers, Alpine Pre-Amp and Kenwood Sub. Backup camera. Mopar Hood Lock and Fuel Door. Rugged Ridge Hood Latches. Clifford Alarm. Uniden iWitness Dash Cam. Bartact Front Seat/Console Covers. Dirty Dog Cargo Straps. Being a retired body shop mgr. for over 30 years at a large DFW automotive dealer I can tell you it's an insurance claim. I've seen this happen several times in my body shop days and never saw the vehicle manufacture pay for it. Just make the insurance claim, pay your deductible and be done with it. I personally think that either someone could have messed with the hood and the locks loosened, or never locked the correct way for whatever reason. Remember three locks have to fail here to get the hood to come up, proving how that happened is going to be the hardest answered question. JK4Three, pos and old8tora like this. Should you go the insurance route I would think that this would not be a collision claim but rather a comprehensive claim which hopefully has a lower deductible for you. I see couple of problem with story, for one no one drives on 14 at 60mph ( everyone goes 75+). Second there is 3 points to hold the hood and it’s a known issue but I don’t believe it’s a known problem for hood to open if properly latched. It seems to me that hood was not latched correctly or someone unlatch it. It was quite a windy day and I was driving 60mph when suddenly the two hood latches and the middle latch failed causing the hood to slam into the windshield. Wow. The left side latch had to fail. The right side latch had to fail. The middle latch had to fail. And the backup middle latch had to fail. That's a lot to all go wrong at the same time. I agree. It would be tough to prove it that all these parts failed simultaneously, all due to some manufacturer defect. I am sure FCA will counter some unknown third party was tampering with the latches; possibly in an attempt to steal something. USStrongman and bek1 like this. "This will acknowledge your recent contact to Fiat Chrysler Automotive (FCA). We are sorry to learn of this incident. Your claim is currently under review. Should a physical inspection of your vehicle be necessary, you will hear shortly from a representative of our inspection company, Engineering Analysis Associates. They will provide further details about the inspection scheduling. Our investigation process can average 10-14 business days, although some take longer. Substitute transportation is not provided by FCA during this time. If you have not already done so, we recommend you also notify your insurance company, as they have primary responsibility in these types of incidents. Should you have any further questions during the investigation, please reply by email. Thank you for bringing this to our attention, and for allowing us the opportunity to properly look into this. We all want to believe our Jeeps are not capable of hurting us or causing damage, but it is reality. When confronted with this information, some of us may choose not to believe it. I have experienced it first hand. Hood flutter should not be considered acceptable. It is the precursor to a major accident. My car is sitting at Hunter Dodge Chrysler Jeep Ram for the special investigative unit to investigate my claim that all latches failed and the hood rocketed into the windshield frame. I will keep all informed of the outcome. For all the people who are saying insurance please look at the photo's, both side latches did not come undone they failed catastrophically. As far as the safety latch in the center there is only about 1/4 of an inch contact. When the side latches failed that will allow the hood to twist. You can almost do that by hand, imagine what a 60 mph into a head wind will do. OP I bet if you look at the rear hinges you will find signs of twisting. Sorry guys while I am sure insurance would cover this it is in fact a manufacturing defect. The side latches should not of failed and they did. jeepers29, Motor7, ChuffHugginLoognat and 8 others like this.